I think we can all agree that the artwork on National Chicle was ridiculously bad. But that swatch is ridiculously awesome! Definitely from a Mets jersey and all kinds of dirty/aged/old. Thanks Joe! Next up, we have Matt from DocHoloday. 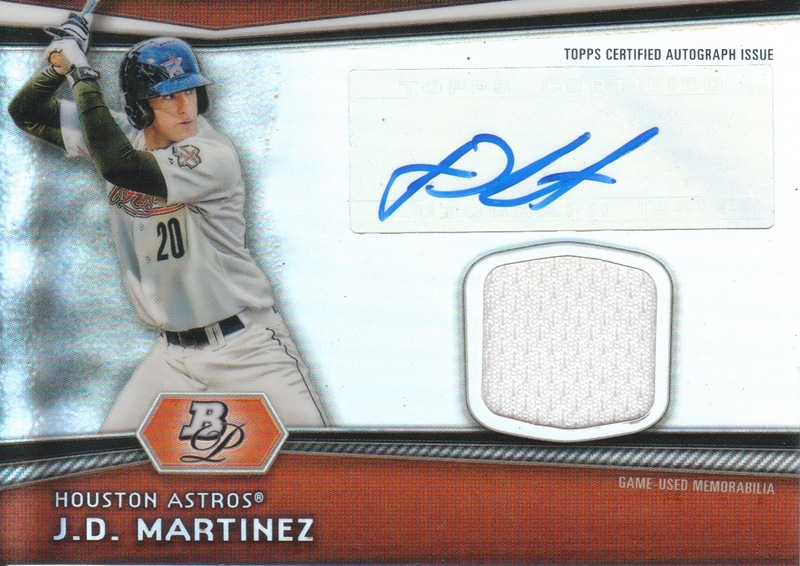 He also wanted a card from my Triple Threads bender and while I've yet to mail his package (Matt, it's packaged up and sitting on my desk as we speak, may not go out until Friday though, we'll see) I did get his cards in! A nice JD Martinez unity auto/relic numbered /75! 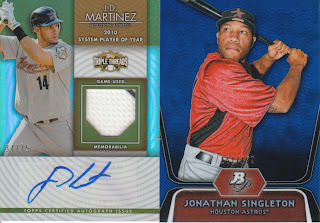 The Jonathan Singleton /199 is pretty nice too! We may see Jonathan on the big league club this coming year or next. JD struggled at times this year but hopefully next year he'll be mashing HR's again and be a productive every day left fielder. 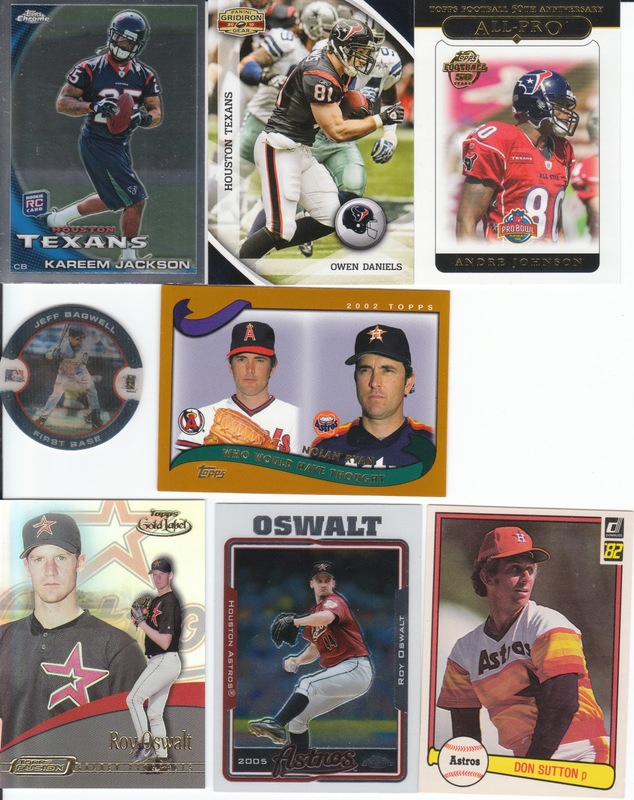 Dennis collects a lot of football so he sent me some Texans and then a bunch of random Astros! 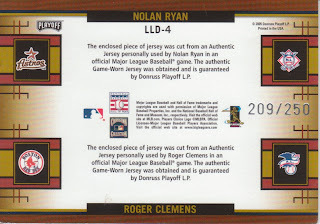 The scan is deceiving, this card is a box loader! It's huge! 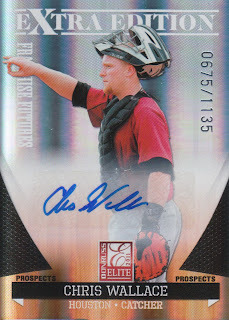 And the auto is freakin' sweet! There is no COA language on the back and I can't really tell but it looks like an actual autograph to me! Thanks Dennis!!!!! The great people over at Lil' Teammates have contacted me for another product review after the success of the last review here on the site. 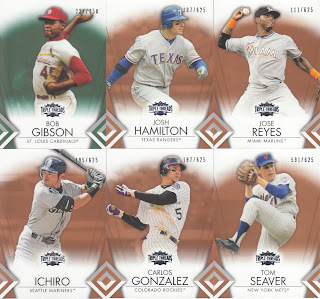 This review is for the Lil' Teammates Collectible Team Set! Please watch the video below for a product opening and display! UPDATE: I MADE AN ERROR! WE ARE ONLY GIVING AWAY 2 Lil' Teammates prize packs! ONLY 2, I accidentally said 3 in the video. So please, don't kill me if you're the third in the randomization, there are only 2 winners!!! WATCH THE VIDEO TO THE END TO SEE HOW TO ENTER 2 SEPARATE CONTESTS!!! Ok, so basically those are awesome little dudes and if they stay in the package, I think they'll look great on a shelf as well. But I like playing with my toys so out of the package they came! • Fully licensed 3" tall vinyl figures with rotating head, arms and waist. Fully licensed: YAY! Gotta love a company who goes through the necessary steps to use all logos! Articulating: Moveable parts make the toys more fun. Size: They are big enough to actually play with, but not so big that they are cumbersome. Fun Factor: I just really think they could be a lot of fun for kids, maybe I'm not an expert on this as I don't have any kids, but I think if I were a kid and my parents gave me these, I'd be pretty excited about it! Price: Personally, I think it's about $6-$8 too high, but then again that's MSRP, not actual retail so maybe you can find them on the market out there for cheaper. Teams: Why not all 32 teams? Especially for this Texans fan! Not cool. If they had them for my team, I'd probably buy one for display in box, and one to take out of the box. Instead, there are fans of 10 teams who will have no reason to buy them! The football is attached to both the RB and the QB, I think it would be fun to have it detachable. So there you go everyone! I hope you enjoyed this peak at a fun new product! Please remember to enter both contests! Oh yea, and if there are multiple winners of the second contest (my contest) random.org will be used to determine the winner. Alright, I think I covered all my bases, if you have questions about the contests please e-mail me. Your eyes don't deceive you, for some reason my scanner cropped this card funky, it's a little skewed. Homers on September 21st for 7th straight year? Wasn't aware of this at the time it happened but an interesting fun fact for sure! I am too tired to google this morning but I'm curious what the record is for most consecutive years hitting a HR on the same date... one of you OCD fact checkers out there will surely look it up and post it here... haha... I'm usually an OCD fact checker but again, 5:14am is just too dang early and I've been up for half an hour already... I'm going to go insert the caffeine IV before I head off to work. It's another great looking card, although I do question the star pattern die cut around the bat piece. 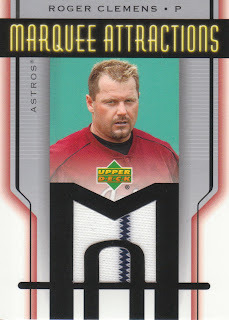 Just make it a circle Topps, stop being overly and unnecessarily creative, just sayin'. I think this represents the early years of game-used inclusions into the Topps products so by that standard I'd say they did a pretty good job. The piece is nice too, it's got some texture to it. 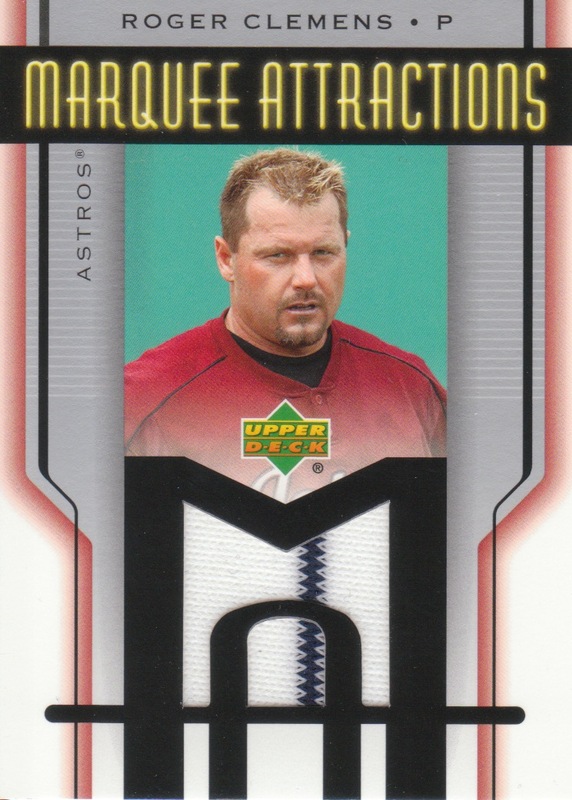 There aren't enough good things I could say about this card. I personally love the unity relics. I've heard some people say they are gimmicky or whatnot. 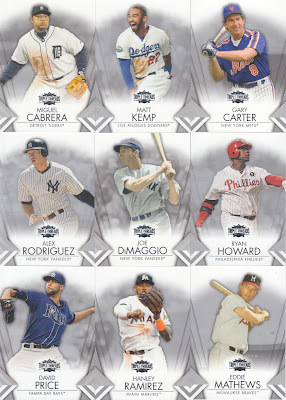 But if THIS is the gimmick that Topps throws out that you just pushes you too far, I think you've got bigger problems! Haha! A sweet looking card and glad I was able to add it to my collection! 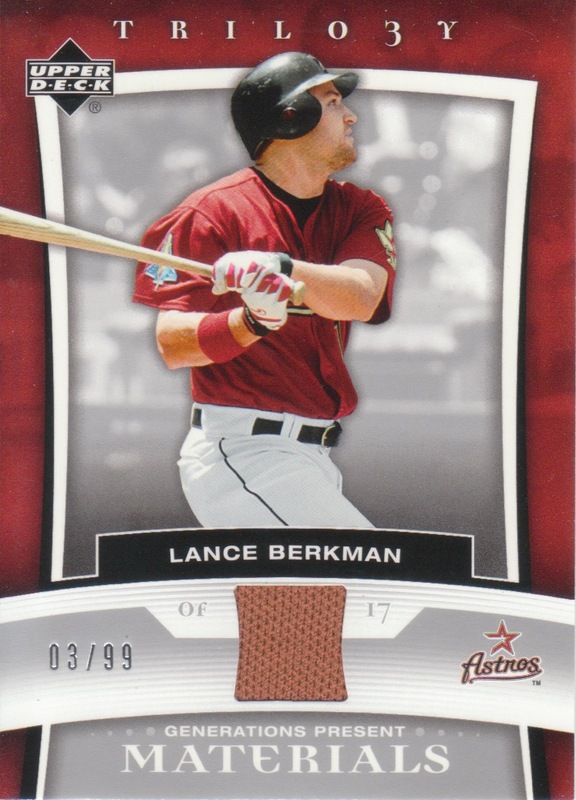 I totally had no clue what set this card came from until I looked it up but it was numbered /99 so I was pretty excited about it. This is another in the great design group for me. I love the Astros logo in there on the bottom left. 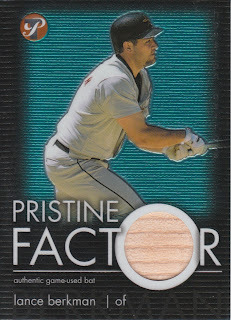 The swatch isn't messing up the photo and the background is all refractor-y. 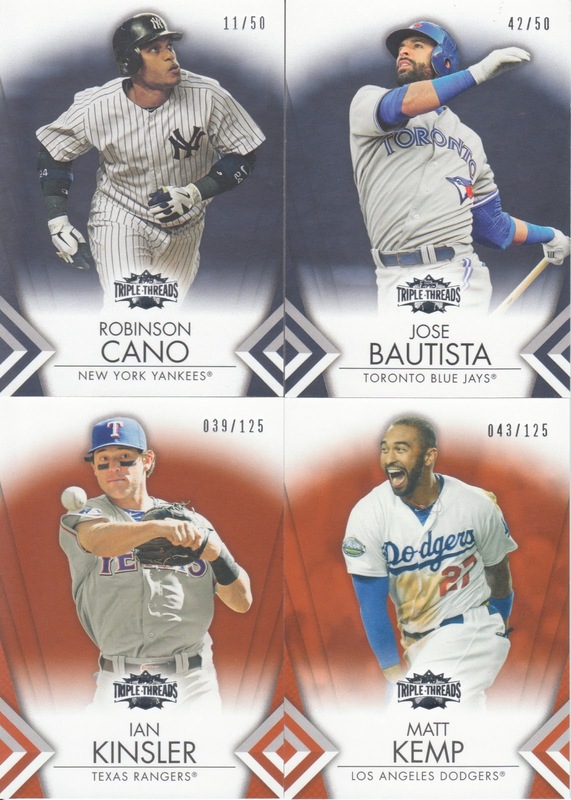 May have to look into this Topps Clubhouse set for a break some time. Just seeing the Fleer Ultra logo brings back memories of Fleer and it's various sets. 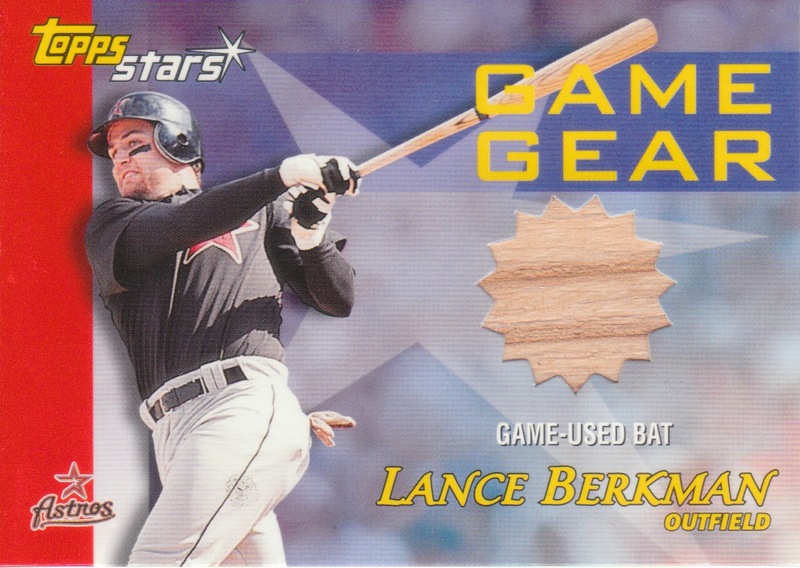 I wasn't collecting when Fleer died out of the market place, so it's fun to go back and pick up cards like this one. And Lance, why so serious? 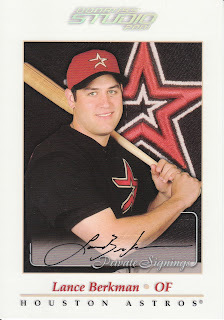 Here we go with another Lance Berkman card, this time from 2003 Topps Pristine! Wow, a great looking card, even more impressive in person. 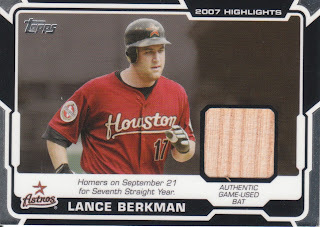 A big chunk of game used bat, high gloss finish and another good action shot of Lance at bat. 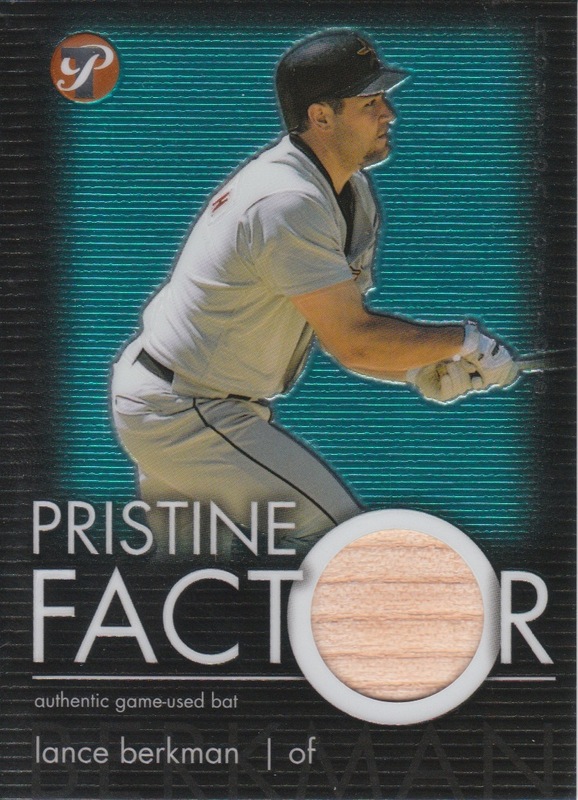 I like the all lower case lettering after the PRISTINE FACTOR card title. The stack is dwindling but I'm not even half way done yet with this COMC Haul! 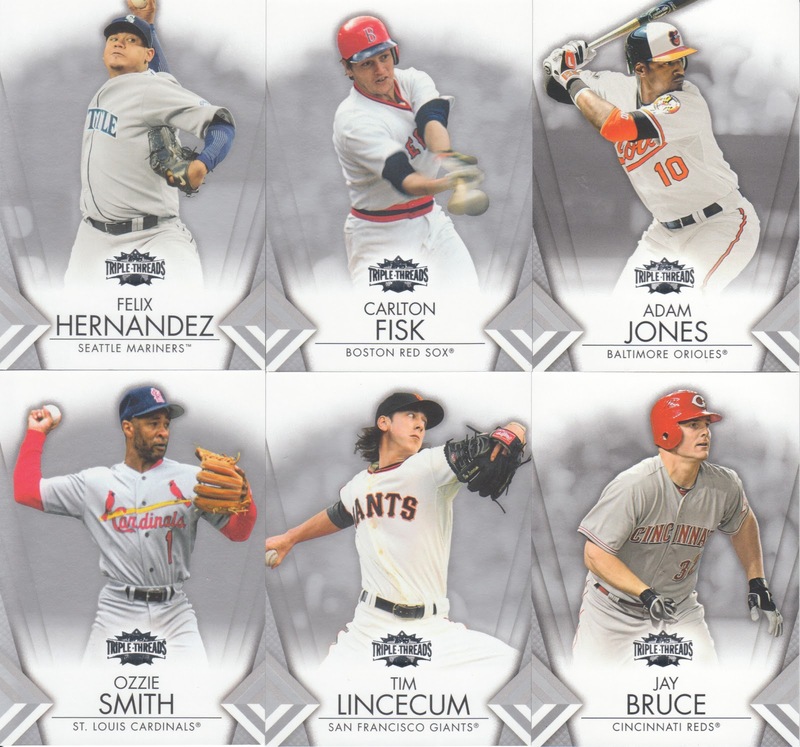 I wish Topps was still producing Pristine instead of a couple of their other high enders... but I guess sets come and go and Pristine was one of those that had it's heyday and then moved along. 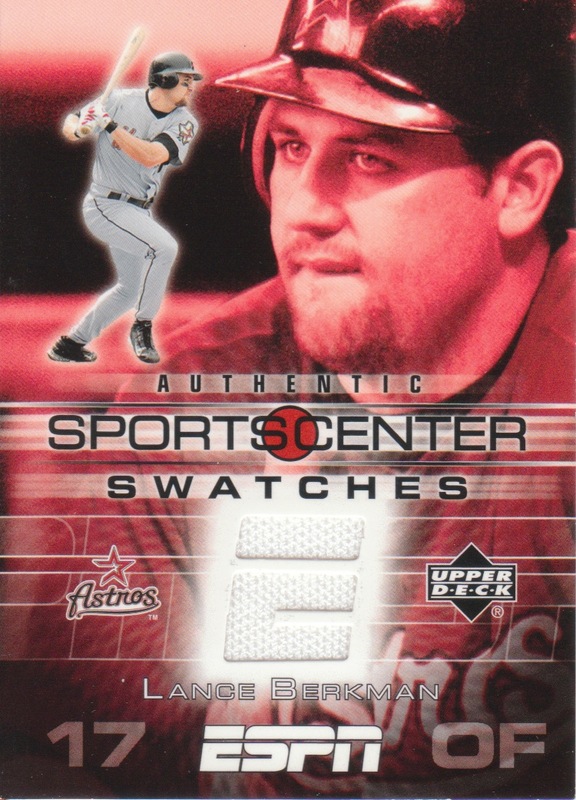 Pros: Dirty looking swatch, pinstripe, great photo, good design and a note in the corner to let you know what level of rarity you've pulled. 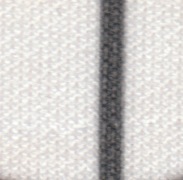 Cons: Pristine die-cut logo going across the swatch. I shudder to think how many of those things got torn or damaged by over excited kids, or just in the production process. 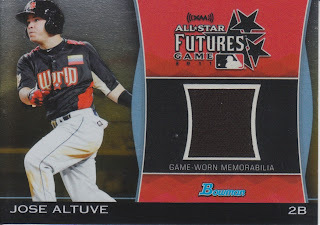 Anyways, not the greatest idea on that one Topps. 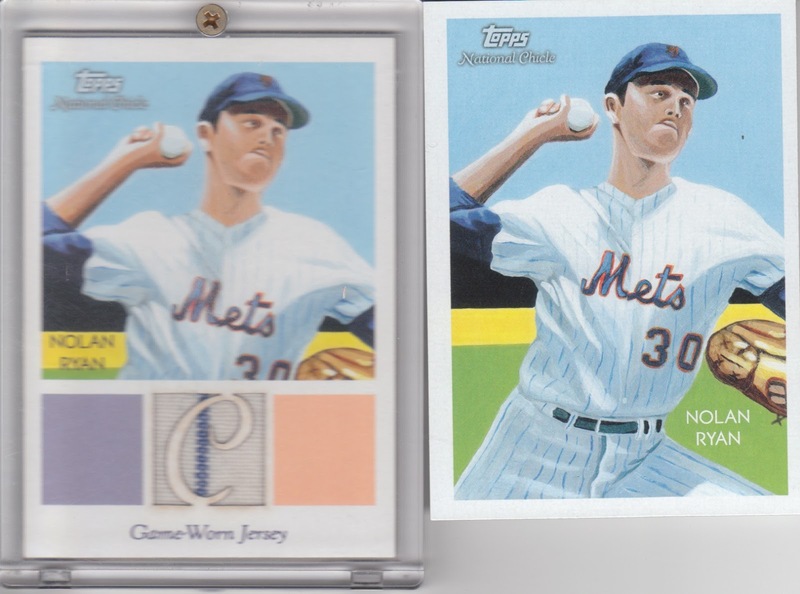 I love that you can see exactly how discolored the jersey swatch is in comparison with the stark white of the rest of the card! Was glad I picked this one up! Stay tuned for more Pristine tomorrow! 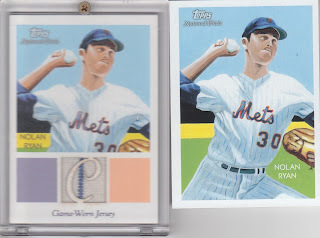 I'm not sure where Topps came up with the idea of the silk cards, but I am glad they did. 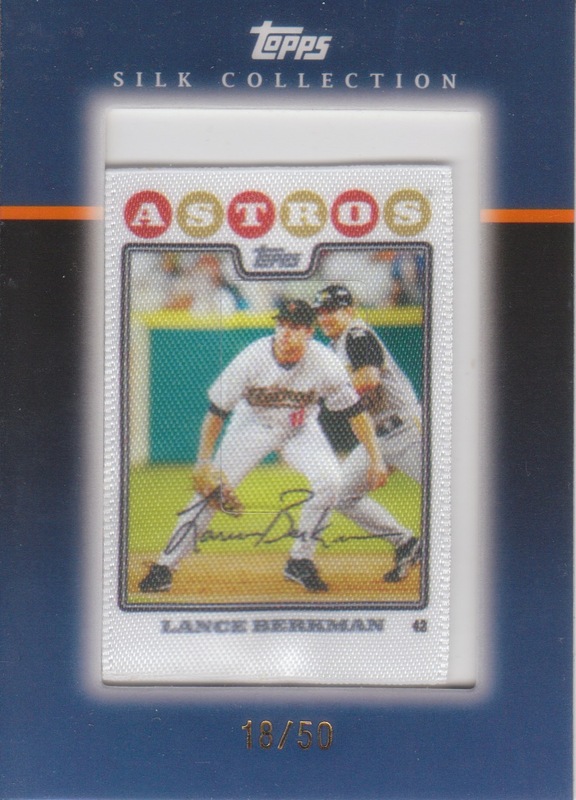 This is my second Lance silk, as I also have an A&G silk from 2009. The fact it's a low numbered release out of 50 makes them pretty cool. 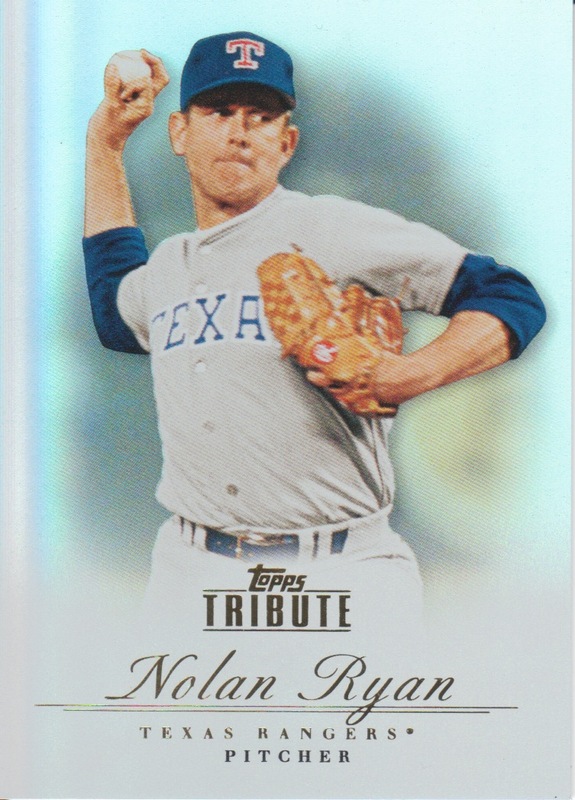 About a month or two ago, the Hotwit and I fell on some hard times, I had to sell a bunch of stuff and I even considered selling a couple Nolan Ryan autos to get us through. I was re-considering my entire collecting strategy. But times have changed and the sun is shining on us once again! We have a new tenant in our home back in Houston and two weeks ago now, my wife got a job here in Alabama after a year of searching! We decided to split the first couple paychecks as a reward/splurge after all this time to get it out of our systems, and splurge I did... 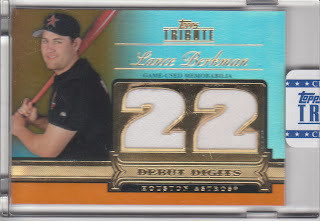 I decided it was time I stick my toe into the deep/high end of the baseball card market. 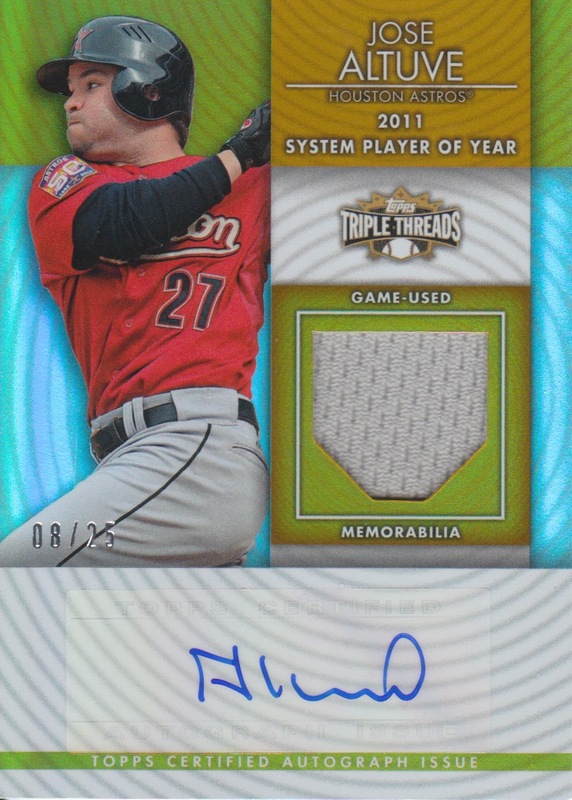 Triple Threads was in my sights. Well, what started as a toe turned into a cannonball. I bought 2 1/2 boxes at my LCS. Do I think I got my money's worth in the end? Most likely not but I did have a hell of a great time busting some cards. Hopefully if this project goes well, we'll be able to do things like this from time to time! I ended up with quite a haul in my parallels. Lots of superstars, not a "dud" in the lot. Then again, not a single card that fits in my personal collection either. 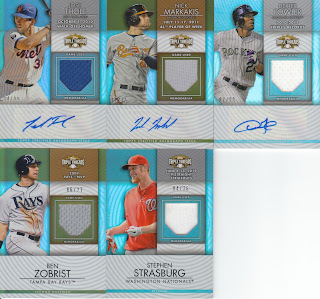 Speaking of duds.... yea the best auto in there is Markakis or maybe Fowler, but the Strasburg /36 is pretty nice! Wow, so much better! 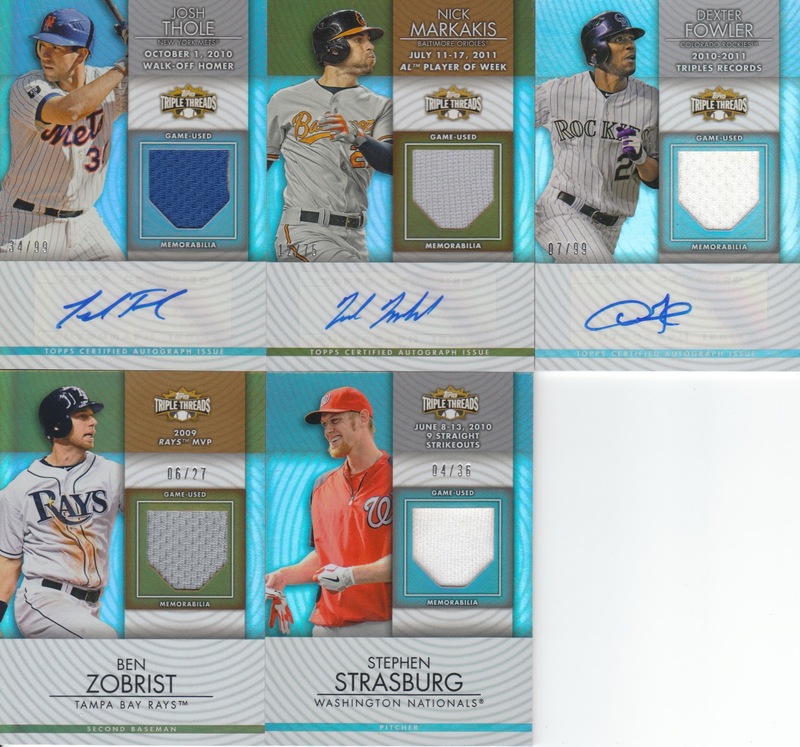 The Strasburg is #'ed 2/9!!!! Yonder Alonso could be a card to sit on a while and see if he takes off there in San Diego. 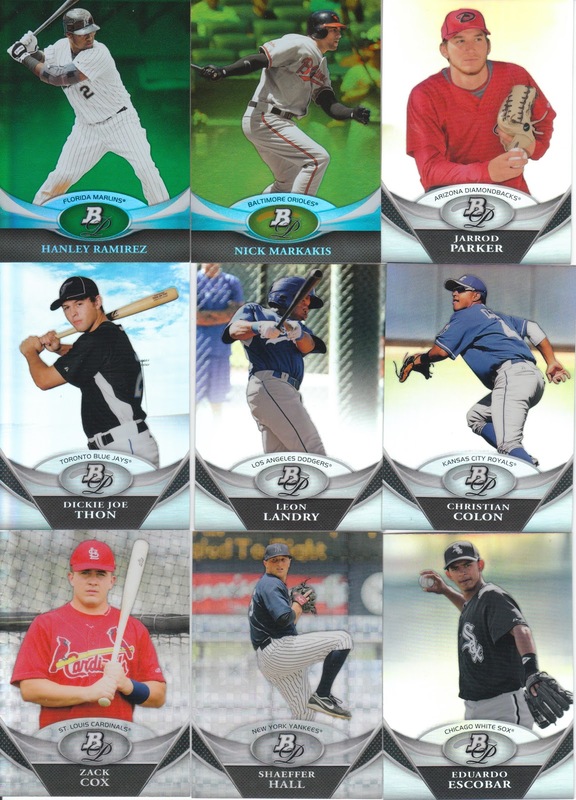 Ellsbury and Kinsler are nice pick ups. 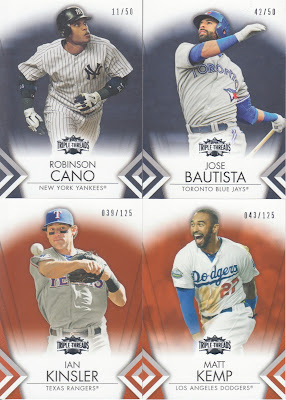 All three of these look great in person and scanning any/all of these hits don't do them justice at all. Not too shabby at all! I was pretty pumped when this was revealed in my last pack, up until then I was contemplating just running out of the store without paying and never coming back.... haha, just kidding... it was somewhat brutal until this one and I'm glad I got it! 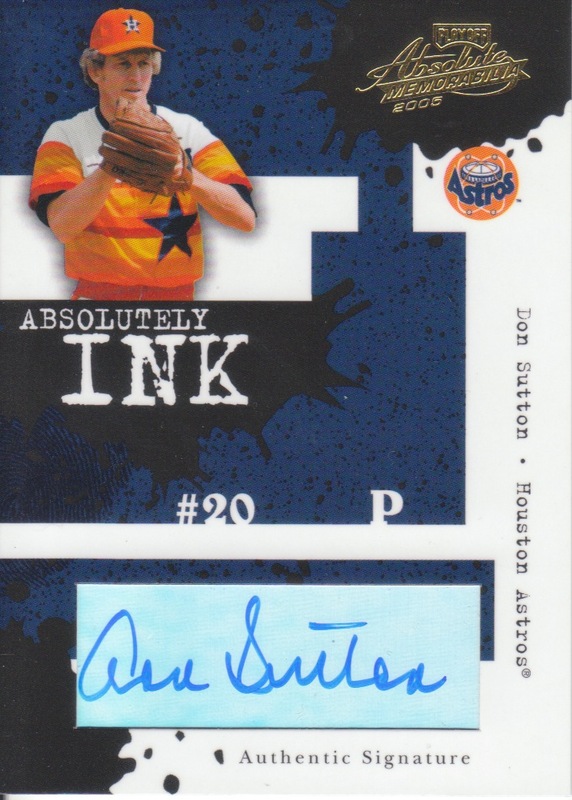 It's a great looking card even if they used stickers. I know there's got to be a Braves fan out there who'd love to get their hands on it! Any and all of the cards in this post are for trade, but please understand that while I'm not asking for a kings ransom on these, I'm also not trying to give them away. I was needing to re-fresh my trade bait and boy did I!!!! If you see anything you're interested in, you know how to get a hold of me! In the current era of super-jumbo-full-card jersey swatches, it's kind of refreshing to have a smaller swatch that actually fits with the design. The card works, the design isn't an eye sore and the material doesn't feel like it was forced onto the card. It's numbered /99 so that's nice! I really liked this card when I saw it online and definitely goes as one of my favorite Berkman swatches in my collection! 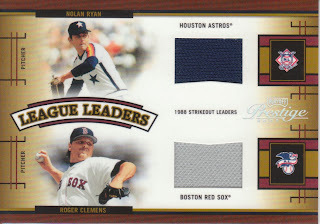 Wow, a dual relic of two of my favorite pitchers! I don't know if it was the steroid backlash or what but I offered a figured I felt comfortable with and they accepted. 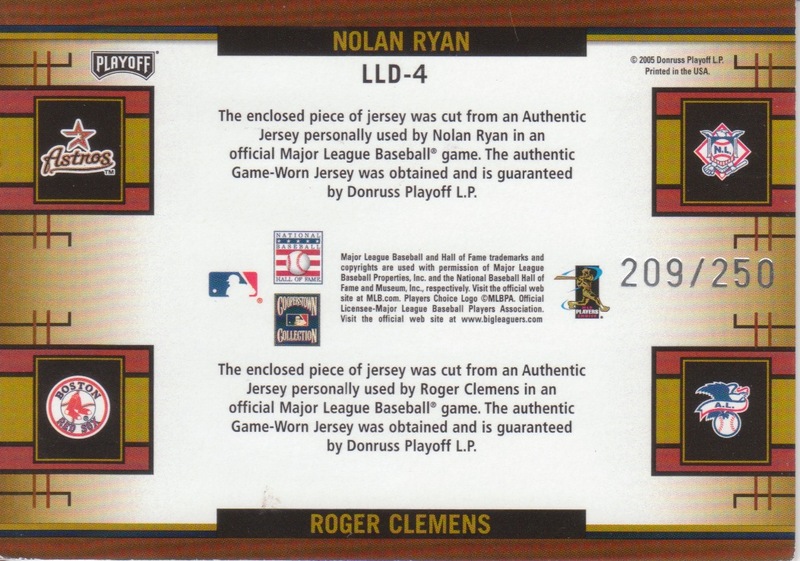 Any time I can pick up another Nolan relic, I'm going to do it. 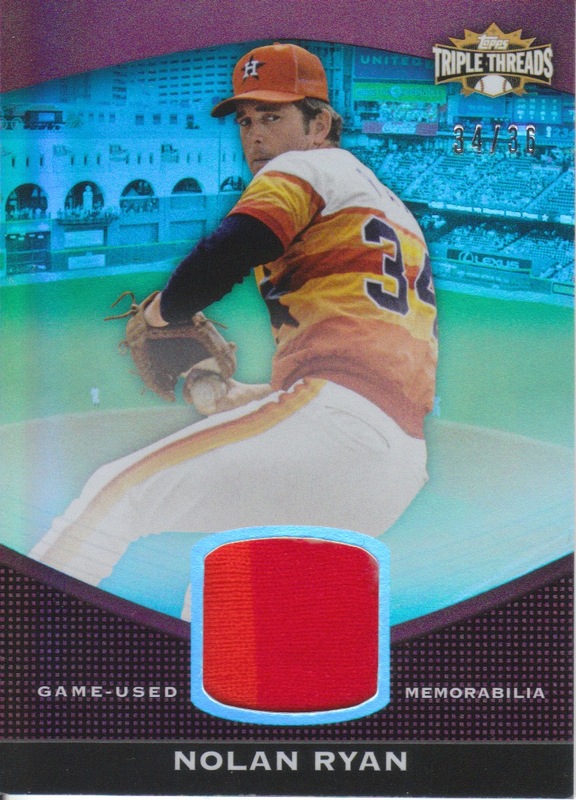 As I've stated before many times, I think eventually Roger gets in the HOF so this card is going to definitely be worth what I paid for it and more. I saw this card and the low price it was going at on COMC, and got another steal. This is the parallel version that is numbered out of 50! 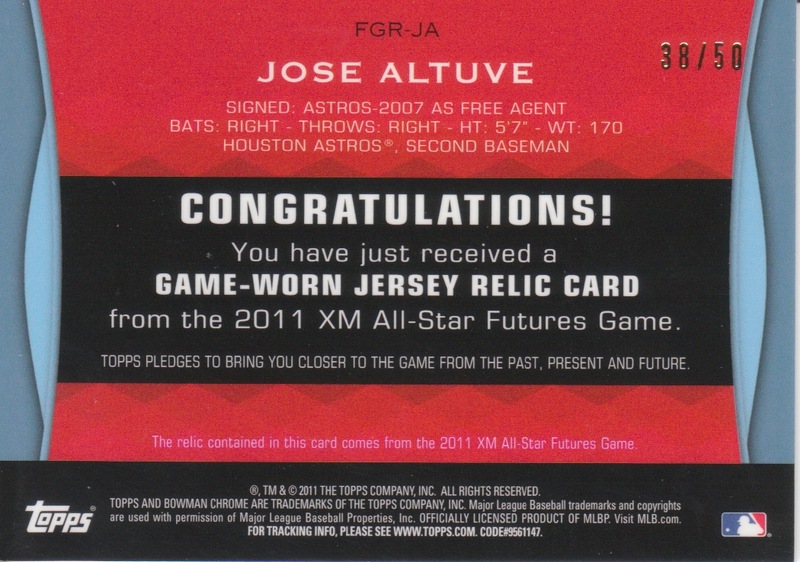 It's crazy that just a year or so ago, Jose was playing in the FUTURES All-Star game! This year he was our All Star representative in KC. 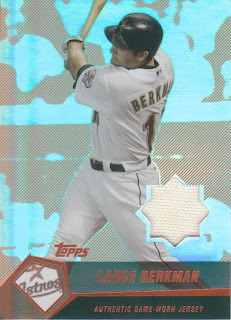 I love the design of the card, good job Bowman! 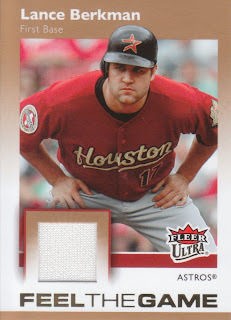 Yesterday I showed off a LCS pick-up of a Triple Threads card of Jose Altuve! Today, a much cheaper pick up of another Jose Altuve Autograph! 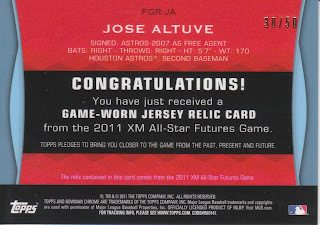 I don't know how you get "Jose" or "Altuve" out of that autograph, but who cares... at least it's consistent! Plus, the picture here shows some hustle. 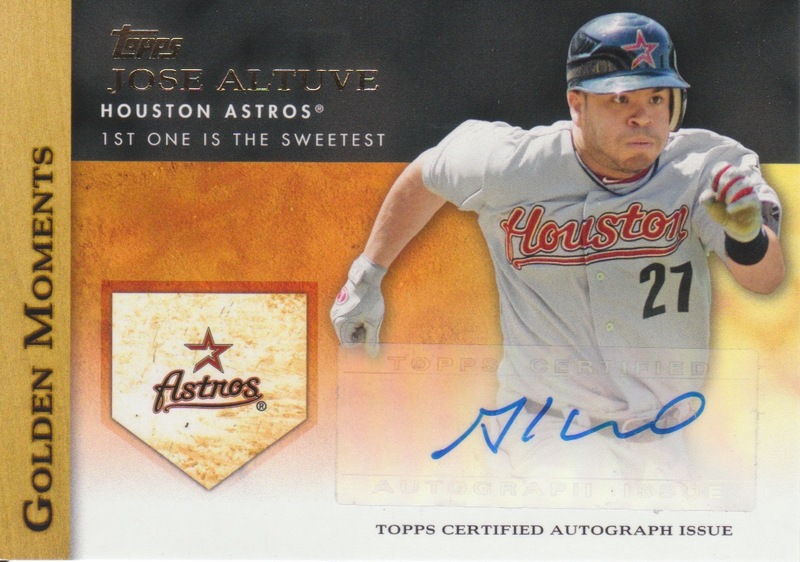 Altuve's a motor guy, a guy who no one thought would make it because of his size and he just kept doing what he does best. The results were impossible for fans or management to ignore and he shot up through our minor league system quickly. There was talk this year of trading him, as we have Jimmy Paredes hitting very well in the minors and his usual position is 2B as well, but I really do hope Altuve is the next Astros lifer. I hate that Hunter Pence went to Philly and then San Fran, although I'm glad he's doing well, but I had thought I'd end up watching Hunter's entire career here in Houston only to be left with memories of his first few. So I snagged a card off eBay from my LCS... basically Big Hit Sports Cards had put it up on eBay for a customer, and at $25 BIN, I offered $21 and viola it's mine... it's freakin' sweeeeeeet! That's out of 25!!!! I saw one out of 50 go for around $32 the other day so I got one steal of a deal! SWEEEET! 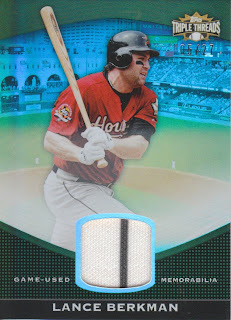 I love it, great design on Triple Threads this year and I like that they Astros that are in the set are affordable on the secondary market. Stay tuned tomorrow for the second of my COMC pick ups! 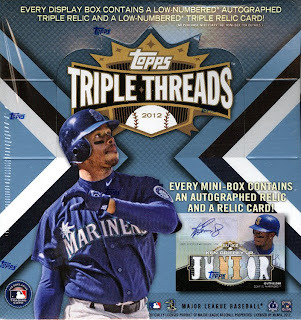 I recently bought into a group break at Mojobreak.com for a 9 box 2012 Topps Triple Threads case break. Using their discount code, I got the Astros for $18! I took a gamble as there are very few Astros in this year's TT set! Let's see how I did! WOO HOO!!!! Ok, so I had already gotten a Ryan /625 off eBay so this one is for trade! But how about that Altuve!?!??!?!?!?! 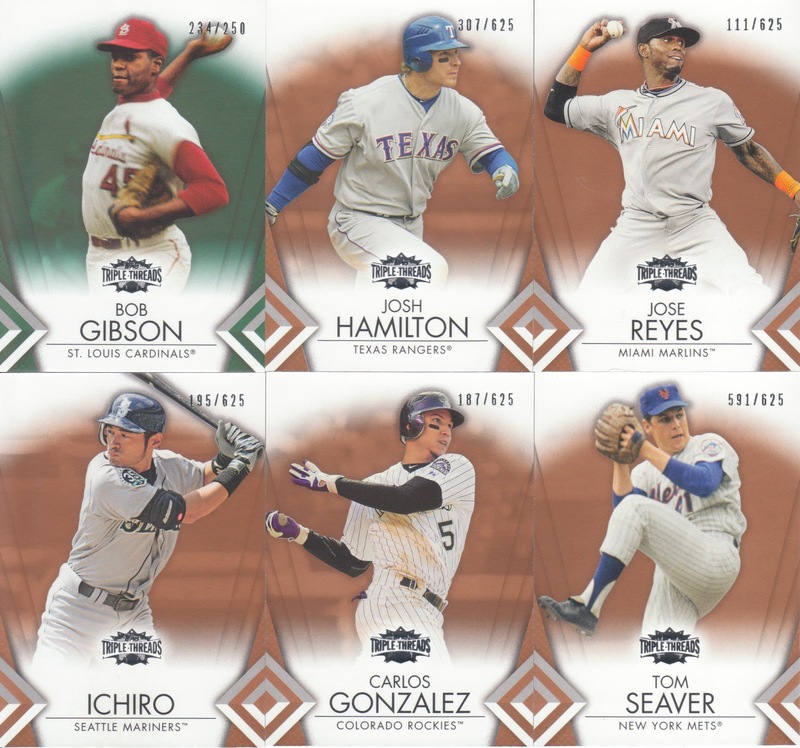 Numbered 9/10? It's a very slick looking card and the autograph is ON-CARD! No sticker! The relics are all pieces of bat, but I can certainly say I got my money's worth. 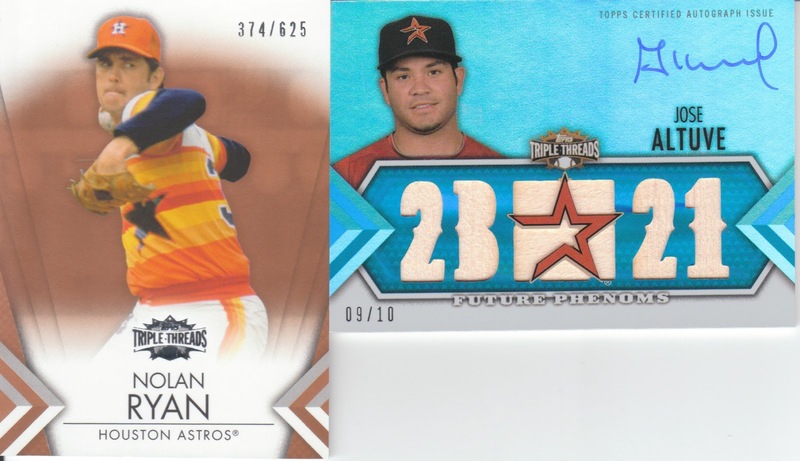 What is crazy is that both of these cards were in the same pack, so I hit two cards in one pack and nothing else for the rest of the break! Lucky me! 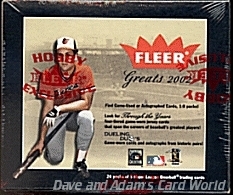 2002 Fleer Greats of the Game! There are some GREAT hits in this product! 24 packs, 5 cards per pack! One auto and 2 game-used cards per box. 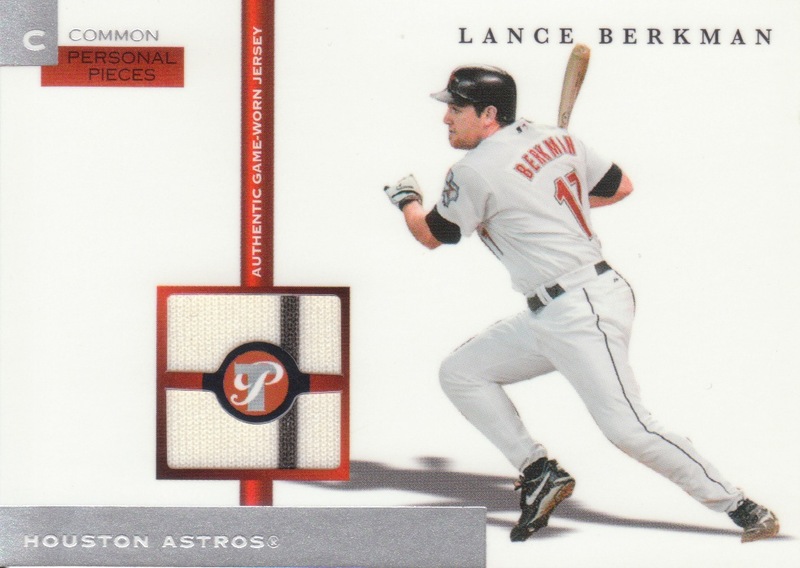 Next we have 2002 Playoff Absolute Memorabilia! This box includes an autographed baseball! As well as two of the much loved hits from this product! 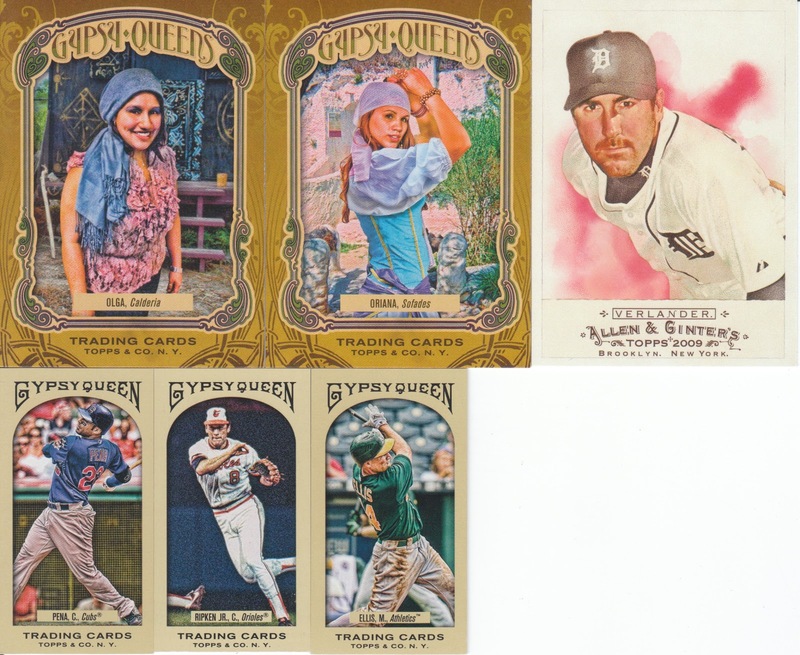 18 packs, 6 cards per pack! Yep, a full hobby box of 2012 Topps Triple Threads... 2 mini boxes per box, one pack per mini box... 3 base, 2 parallel and 2 hits per pack! Some AMAZING and ridiculous hits are available in this product! 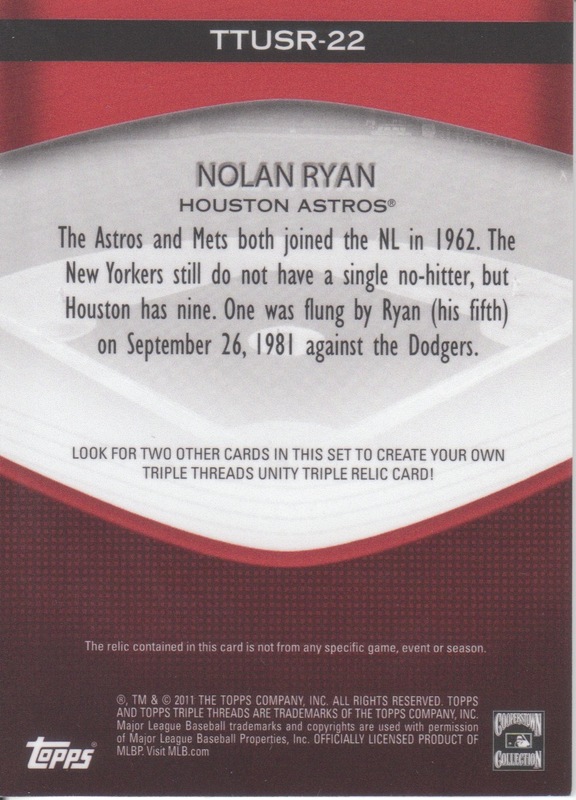 All cards with multiple teams will be randomized among the teams on the card. All multi-team cards which have a team I have purchased or am stuck with at the end, will be randomized by an independent third party. Any non-sport cards will be randomized amongst all teams. 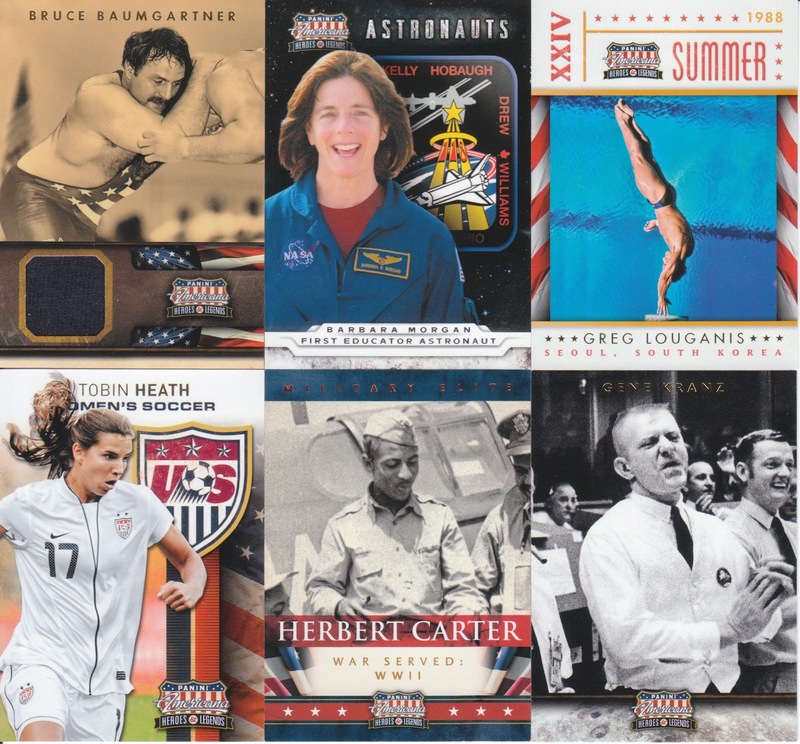 All cards from teams that no longer exist will be given to the team where the former moved (e.g. Montreal cards to Washington). 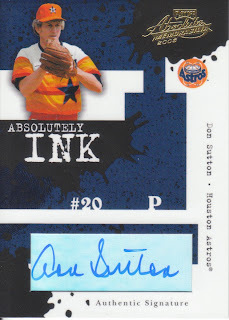 The autographed ball with a player who played with multiple teams will be randomized amongst all teams he played for unless documentation with the ball indicates a team. CLAIM A TEAM BY LEAVING A COMMENT ON THIS POST. Do not e-mail me directly with a team claim, you must comment on this post to claim a team(s). All payments: please send as PayPal GIFT to samuelpair(at)yahoo(dot)com. As an incentive to fill this faster... if all slots fill by Thursday at noon, I'll include a signed ball from my collection to be randomly given to a hit-less team. I really hope this fills fast, I'd love to get these ordered before I fly to Houston on Thursday! Please let me know if you have any questions. This card is even more awesome without the scanner messing it up... 2012 Topps Tribute Nolan Ryan base card. 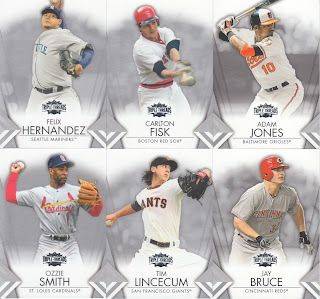 Any ideas from the peanut gallery for October Group Break products? 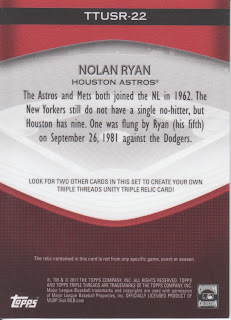 Triple Threads 9 box case? Low-end mid-90's wax? Somewhere in between? 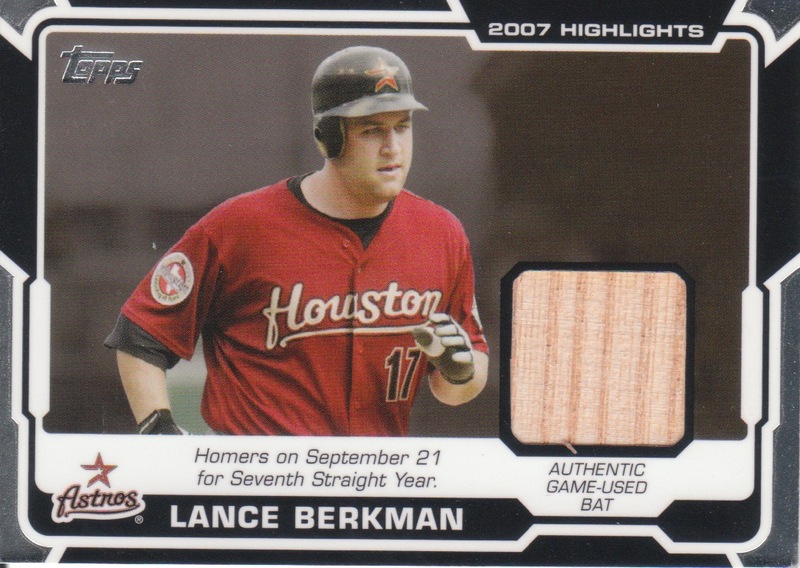 If you say 2007 Artifacts, I'm swearing off group breaks forever... haha!